Why is there a vegetable shortage? Media captionLast month, UK suppliers told the BBC produce from the continent was being "treated like gold"
Anyone trying to stock their kitchen full of vegetables may have noticed a shortage of their favourite greens or salad items. It started last month with some supermarkets having problems stocking courgettes and spinach, while iceberg lettuce is now being rationed by some chains. Retailers have blamed empty shelves on bad weather in Spain and Italy. Why are we facing a shortage? A combination of flooding, cold weather and poor light levels in southern Europe is said to have created the "perfect storm" of poor growing conditions. During the winter months, Spain's south-eastern Murcia region supplies 80% of Europe's fresh produce. But after suffering its heaviest rainfall in 30 years, only 30% of Murcia's growing fields are useable. This has coincided with a cold snap in Italy, which normally exports vegetables at this time of the year but is now having to import them. The effects of shortages are particularly pronounced in Britain, which imports an estimated 50% of its vegetables and 90% of its fruit. The Grocer magazine's fresh and chilled foods editor, Kevin White, told the BBC he could not recall the weather affecting supplies so severely. Which vegetables are worst affected? Courgettes and spinach supplies have been severely affected by the cold weather. 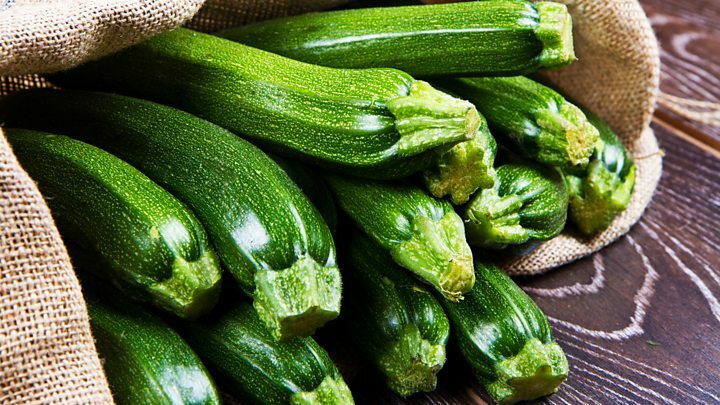 Jordi Vorderman, UK sales manager at Dutch vegetable supplier Valstar Holland, said courgette prices were the worst affected, but that "the cost of everything imported from Spain and Italy is sky-high at the moment". Philippe Binard, of Freshfel Europe which represents the fresh produce industry, said the problems afflicting vegetable production were unprecedented and had left the yield of courgettes, aubergines, tomatoes, broccoli and peppers from Spain down by about 25%. Iceberg lettuces and cabbages have also been affected, with experts unsure where the shortages could fall next. Fruit and vegetable wholesaler Nick Padley told BBC News that more than 90% of Europe's iceberg lettuce came from one small region in south-east Spain. He said: "There's a gap of about six weeks on iceberg lettuce, nothing is coming from Spain for six to eight weeks. Our supplier is now going to be bringing in iceberg from America which is obviously costing more. It's a tough time." BBC News spoke to traders at New Covent Garden fruit and vegetable market, who said they were struggling to meet demand and were planning to import produce from the US. Michael Goodwin said: "I've been in this trade for 40-odd years and I've never known it so bad, where everything is so dear. I've got plenty of English parsnips, potatoes and carrots but foreign produce is like gold." What is the impact on prices? At New Covent Garden market, vegetable seller Mark Gregory said: "Whereas normally courgettes are £6 or £7 [a crate], they're now 20-22 quid and we're struggling to get them. "We usually have a couple of pallets full of them, this morning we've got just 80 boxes." He is awaiting delivery of a lorry load of courgettes which should have arrived on Wednesday but will not be in the UK until Friday. Mr Vorderman said some supermarkets were not prepared to buy courgettes at such high prices and would rather leave their shelves empty. Tessa Knowles, who goes to Italy each week buying fruit and vegetables for a wholesaler, said: "Prices have rocketed. The cold weather has devastated their crops out there. It's also affected the upcoming fruit on trees so we may still feel the longer-term effects." Another trader, Tom Craig, said: "Because there's so little produce coming over, the prices have escalated out of control. "It normally is a little bit more expensive in January because of the bad weather but this year is exceptionally bad. Aubergines are £20 [a crate], peppers are two or three pounds dearer than they are normally at this time of year so it's very hard." Supermarkets can chase the sun to get seasonal produce all year round, but the rest of Europe will also be looking for new sources for their produce - all of which could push up prices even further. What are the supermarkets saying? Wholesalers have told the BBC they know of customers who have cleared supermarket shelves to try to supply restaurants and caterers. Though customers have noticed some empty shelves, not all the supermarkets are reporting shortages. Co-op said it was not experiencing any shortages, and Sainsbury's said it was working to maintain its courgette supply for customers. Similarly, Lidl said: "We are working closely with our suppliers to maintain the supply of products affected by the weather conditions in Europe." On a shortage of iceberg lettuce, Tesco said it was "working with our suppliers to resolve them as quickly as possible".